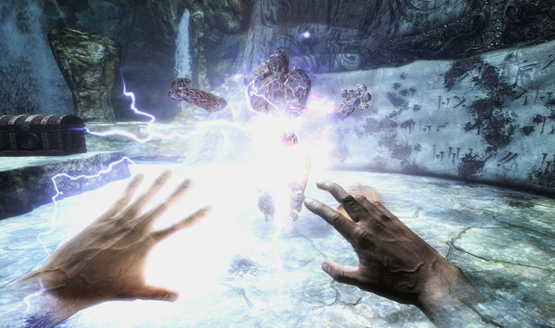 Since its thundering debut in 2011, The Elder Scrolls V: Skyrim has been a monstrous success. It’s seen three huge expansions, repackaging as a complete edition, release on the newest generation of consoles in a remastered edition, and most recently, its port to the Nintendo Switch and PlayStation VR. When I first saw the PSVR version announced, I was immensely excited. 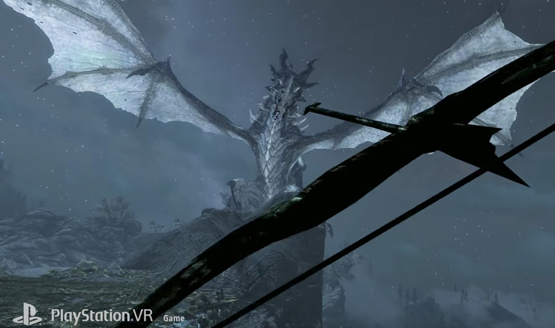 Skyrim in VR? What could possibly be better? But I was forced to quickly temper my expectations. Surely PSVR isn’t capable of hosting such an enormous game as Skyrim, right? “This will surely be a pared-down, Skyrim-lite experience,” I thought to myself. I’m happy that I couldn’t have been more wrong. For the record, I’ve never completed Skyrim. Its massive world distracts me far too much, and though I’ve played the intro mission a number of times, the open nature of the game quickly sets me off on a paths unknown. You want me to go to Whiterun? Who needs to visit the Jarl when you can go spelunking in caves at the top of snowy mountains for inimitable treasures and powerful weapons? That opening mission sticks with me, however, each and every time I play it. And shortly after donning the headset, there I was again, in the back of the wagon, bound for my own execution. It was a pretty cool moment, but again, I didn’t let this excite me (too much. I have to admit I got a little giddy). I mean, this opening portion is largely on rails anyway. The real test would come later. As I created my character, I was able to lean in and around the character model, getting that full sense of depth and immersion. The various menus hang in the world as an object instead of being tethered to your vision, so there’s never a sense of leaving the experience to do things like inventory management or obtaining skills. But let’s get back to the experience of that opening mission for a moment. There I am, head on the chopping block, and Alduin, the great dragon, comes flying in to destroy the town. Now I’ve seen many wonders in VR, both big and small, but there’s nothing quite like feeling vulnerable in the face of the most powerful dragon in Skyrim. It was an awe inspiring moment in the original game, and it carries all of that weight and more in virtual reality. Freed from my bonds, I was finally give control of my character to escape Helgen, after which the full experience of Skyrim awaited me. Let’s get one thing straight. Skyrim VR isn’t a simplified Skyrim VR experience. It’s not a version of the game that’s been sliced and cut for virtual reality. It is Skyrim in all of its glory. It is stepping inside of your TV screen to become the Dragonborn. It is the full breadth and depth of the open-world fantasy adventure that captured gamers’ attention six years ago, completely in VR. While it would have been simple enough to make a Skyrim where the camera was controlled by the VR headset, that wasn’t enough for Bethesda. 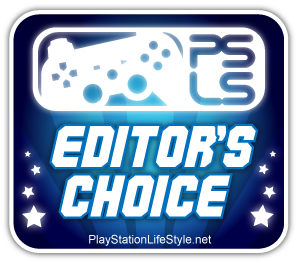 The set out to create one of, if not the best, open-world experience on PlayStation VR. That simple and basic Skyrim is there, as simple and basic as the enormity of Skyrim can be. Players can use a DualShock 4 to play the game with original controls intact, using virtual reality as another level of immersion. Opting to play with the Move controllers, I was treated to a whole different level of the experience. No longer were my hands tethered in that traditional first-person view. My aim was not tethered to the direction I was looking in. I could swing a sword at enemies myself, aim my fire magic, nock an arrow to a bowstring, and hide myself behind a shield. None of this is new for VR games, but it’s new for Skyrim. And such a massive open-world adventure with hundreds of hours of content is new for VR. They complement each other perfectly, supplementing and adding elements that the other did not have before. Where other developers have seen the Moves as a limitation, Bethesda saw a challenge. Point-to-point teleport controls are available for those who get nauseated with free motion, but the real highlight is how they created full ambulatory movement controls on a pair of controllers that don’t have analog sticks or directional buttons. Separating the controllers between left and right, each button does something different to offer everything that you’d expect to find in Skyrim. The left triangle button opens the character menu, while the right one jumps (or crouches for sneak when held down). Holding the Move button on the left controller, walks the player in the direction the Move controller is pointed, while X and circle on the right controller will turn in increments. The Move button on the right controller is typically for talking to characters, looting, and activating items. It took a few minutes to get used to, but once I did I was thoroughly impressed with how well the Move controls work. 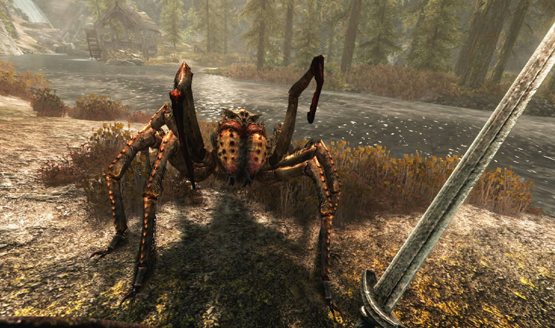 Skyrim VR might highlight some of the limitations in Sony’s VR platform, but it also highlights the brilliance of the development team at Bethesda to overcome many of the obstacles that could have gotten in their way. They’ve literally taken one of the biggest and most lauded games of the last decade and made a praise-worthy VR version of it, when even a half-assed port would have guaranteed sales. Hell, even sitting in the three-dimensional starscape of the skills menu is a stunning experience that could have just as easily been left a dull two-dimensional screen. Knowing that everyone’s tolerance for VR isn’t the same, Bethesda added a lot of customization options to the comfort settings. Players can change how much of a vignette comes in when moving or turning, change the rotation angles for turning, and make the snap either instant or gradual. If you’ve followed VR, then you know that increasing the comfort settings will lower the sense of immersion. Finding the lowest comfort settings that you can stand is the best way get everything the experience has to offer in VR while not getting sick. Opting for sliders instead of toggles, Bethesda allows players a lot of control over their own experience and comfort in Skyrim VR. Graphically, the game is a lot closer to its original PS3 version than the newer remastered editions, simply due to the limitations of rendering in PSVR. It’s sure to bother some, but for those who can allow themselves to get immersed in virtual reality despite graphical quality, I found it easy enough to lose myself in the world and largely forget about the flat textures that cover many of the surfaces. Keep in mind that I was playing on a standard PS4, too. It’s possible that the Pro does a better job at handling the rendering of a massive open world in virtual reality. Exploring Skyrim has never been more awe inspiring that being able to step into the world myself. Being able to feel like I have full control of my body, the aiming of my spells, and the swing of every weapon amplified the immersion as I explored the highest peaks and deepest caves. This is a game that I’ve experienced before, in a way that I’ve never experienced it before. Even the remastered version didn’t drag me back to the world of Skyrim, but somehow I’ve already poured hours of my life into Skyrim VR, and can’t wait to hop into the armor of the Dragonborn again. Every time I put on the VR headset, I’m reminded of just how incredible virtual reality is. A similar awe catches hold of me with games like Skyrim. It’s still hard to comprehend that Skyrim, a game from 2011 not originally designed for virtual reality, is now PlayStation VR’s killer app. Marrying these two ideas seemed like an impossible feat, but Bethesda pulled it off. Skyrim VR is anything but a simple port to virtual reality. It is lovingly crafted with care and attention to make one of the biggest and most memorable VR experiences since the platform first launched. Skyrim VR isn’t just a must-experience for PSVR owners; it’s a reason to buy the headset. Skyrim VR review copy provided by the publisher. Version 1.01 reviewed on a standard PS4. For information on scoring, please read our Review Policy.